Sony is coming out strong this year. Just in time for football season, they have already released the VPL-HW30ES, a 1080p SXRD 3D projector that once again raises the bar on what we can expect from a Sony 3D projector. The HW30ES builds on the successful Sony VPL-VWPRO1 from earlier this year, maintaining similar features and image quality while incorporating the 3D capability that Sony first introduced in the VPL-VW90ES. But it is not just a copycat. The HW30ES makes some improvements, chief among them being higher brightness and decreased cross-talk in 3D. There's one other thing that the HW30ES shares with the VWPRO1, and that's price. At approximately $3700, the HW30ES offers strong value for the money. Editor's note 10/10/11: We have corrected an error in our comments regarding screen size and brightness. First, let's talk about the differences between the HW30ES and its predecessor, the VPL-VWPRO1 (known in some circles as the HW20). The two projectors share a lot of similarities, from the casework and lensing to the overall quality of the projected image. The specifications have changed slightly; the VWPRO1 is rated at 85,000:1 contrast, while the HW30ES is rated at 70,000:1. While the specifications indicate a decrease in contrast, it's not visible in normal use. Black is just as black on the HW30ES as it is on the VWPRO1, while white is just as brilliant. The two projectors use the same 1.6:1 lens that is standard on all Sony home theater projectors to date, which is good news because this particular lens does not lose much light across its zoom range. The horizontal and vertical lens shift ranges are likewise identical, with 2.5 image heights of total vertical range and 0.5 image widths of horizontal range. This allows you to place the image either completely above or completely below the lens' centerline and gives you a touch of leeway in horizontal placement as well. The connection panels are nearly identical, as are the menu systems. The two projectors even have similar light output in Cinema 1 mode--about 850 lumens. 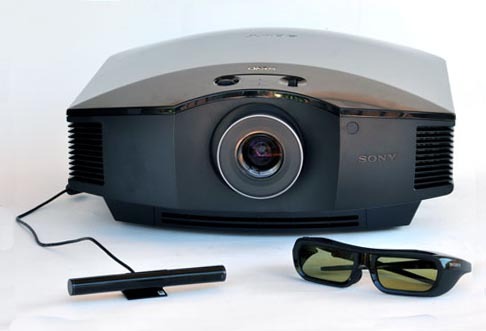 The Sony VPL-HW30ES with IR emitter and 3D glasses. So where do they differ? The best and most obvious answer is that the HW30ES has 3D while the VWPRO1 does not. This capability was first introduced by Sony in the VW90ES, a $10,000 1080p projector released nine months ago. 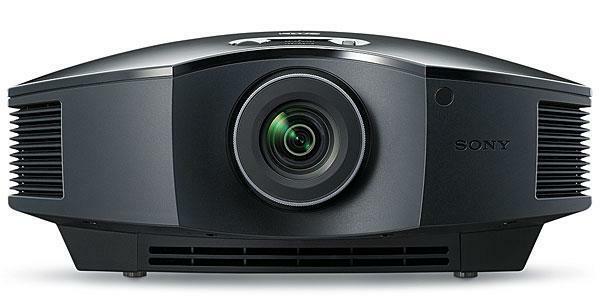 Now, the VW90ES is a much more refined projector in 2D than the HW30ES, with a smoother, more natural picture. In no way does the HW30ES supplant the VW90ES in this area. But it is interesting that the HW30ES is priced at only $300 more than the VWPRO1 ($3700 versus $3400 MSRP), which keeps 3D affordable. Granted, the HW30ES does not include the required 3D infrared emitter (model TMR-PJ1, $80), nor the cable to connect it to the projector (standard ethernet, $15), nor the active shutter glasses used to actually view the image (model TDG-PJ1, $130). All of these accessories drive up the price of the 3D system, so the total cost for a family of four would be $4300. Sony also sells a version of the projector called the HW30AES, which includes the emitter and two pairs of glasses and sells for $3,999. Wow. It sounds like this is great projector, but not quite as great as the Panny. Maybe it is just my bias because I currently own a Panasonic. I am looking forward to the shoot-out. I'm really looking forward to seeing what Epson has up their sleeves though. I am curious about how the shutter glasses work. I know that they use a i/r emitter, but how often does the i/r actually fire in order to sync the glasses? My room, like many others I am sure, has all of the equipment hidden. In my case in an adjacent room. I use an i/r repeater in order to be able to use my remote control. The repeater has a blue LED that blinks each time it receives a signal, which I find a useful feature. Would the i/r sync from the projector cause this light to blink constantly? That would be unacceptable. The 140" screen is double the area of 100" screen, so it requires ~ 600 lumens to light up with same intensity (from 300 lum). The 540 lumens on 160-180" screen may be OK for high gain screen (say 2.8x gain), but not nearly enough for low-gain 1-1.3x. LCOS is a reflective LCD technology that improves black levels over standard LCD, while maintaining color acuracy that DLP cannot touch. Also, with a fill rate at over 93% there is no "screen door" effect. When done properly, the only thing better than LCOS is 3-DLP and if you look at 3-DLP prices, I think you will find the cost of LCOS really isn't so steep when compared to a standard 1-DLP or 3-LCD system.